Whenever I hear of this happening (we usually get an email from a distraught piano teacher who is desperate to save a promising student) it makes me think: What is it that makes someone decide what they truly need. And how can we make piano lessons one of those life necessities? There comes a point for many piano students when piano lessons are up on the “chopping block”. 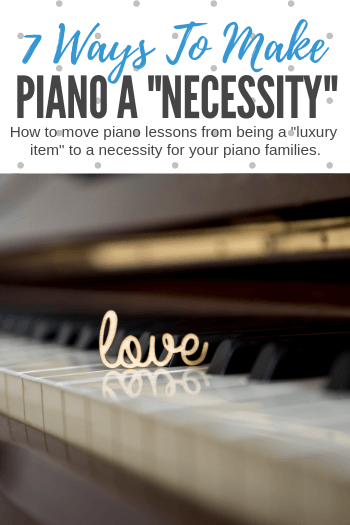 Conflicting extracurricular activities, a momentary lessening of interest, new work schedules for parents, financially tight moments… almost every piano family, at some point, will consider whether or not piano lessons are a necessity or a “luxury item”. And it’s not only because our own livelihood depends on continuing piano lessons that this should be a consideration for us. We all know that the benefits of having music in one’s life are far-reaching (and well-documented). So, for the sake of both our business and our students, it’s important that piano lessons come out on top when it’s time for tough decisions. And while you can’t “save” every single student (and in some instances, you may not choose to) there are always those piano students who you know deep down in your bones need piano lessons. So for those instances, Check out the 7 ways that I’m working to make piano lessons a non-negotiable necessity for my students. 1. Eliminate stress and negativity – Anything that causes an already-busy family excess stress, arguing, nagging, inconvenience or feelings of inadequacy is more likely to be viewed as “not necessary”. This means that having strong systems in place for educating families on efficient and pain-free piano practice at home is paramount. 2. Eliminate Inconveniences – Take a look at all of your systems within your piano studio. Is there anything that you could improve upon to reduce stress or inconvenience on the part of your families? Think in terms of your methods of communication, the way in which you schedule students, the methods of payment you accept, etc. What may take a bit more time to change or set up may make all the difference to families “on the edge”. 3. Build Community – If your piano studio families feel they have a place in your studio community then they are more likely to feel connected to piano lessons long-term. Hosting studio events, parent evenings, group piano classes and recitals are one way to do so. Having a consistently-updated Facebook page is another. Anything you can do to make your families feel as though they belong to something is key. 4. Build Pride – This plays off of the point above. Clearly communicate (often!) what it is about your studio’s offerings that is unique, valuable, desirable and creative. Ensure that the first impressions you leave (all materials, your physical studio space, your overall studio image, etc.) are positive and impeccably professional. Families who enjoy being associated with something are less likely to pull the plug when troubles arise. 5. Be Relevant – Kids have (almost literally) a million different activities to choose from when it comes to after-school offerings. One way that piano lessons can come out on top is by ensuring that the materials you use are engaging and relevant. If your students find piano lessons to be applicable to their day-to-day life then they would definitely miss piano lessons if they were to disappear. Build relevancy by including music your students really connect with, and by regularly updating your lesson materials and teaching practices. 6. Communicate Progress – It’s easy for soccer parents to see their children’s accomplishments; a kicked ball rolls into a net and everyone cheers. It’s more difficult for music parents to judge progress and achievement. It’s up to us to regularly educate and communicate the gains their children are making and how they can support this progress at home. Find a method that works for you (regular emails, shout-outs on Facebook, video recordings, student assessments, personal phone calls, monthly “report cards” etc.) and ensure that this is happening frequently. 7. Involve the Family – Parents who are involved in piano lessons are more likely to view them as important. Encourage family members to be participants during practice time, invite family members in to observe lessons, and create studio events or incentives that involve parents. Making piano lessons a “family affair” will build those feelings of loyalty… rapidly. With enough effort on your part, you can likely make piano lessons be the one activity that is “off the table” when it comes to deciding what stays and what goes when a family is faced with these kinds of decisions. And you’ll not only be doing yourself a favor by doing so. As one of the most popular Facebook shareables we’ve ever created states: “When you’re 90, you probably won’t be playing soccer, doing gymnastics or dancing hip hop. But you’ll still be able to play the piano.” Here’s to a whole bunch of 90-year-old pianists due to your efforts!